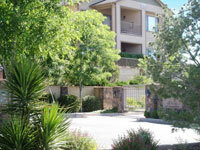 Well designed gardens add richness and tranquility to the lives of their inhabitants. Plantings, whether they are native shrubs or a vegetable garden, add quality to our lives. Softscaping can provide shade, that results in a more comfortable existence, as well as cut utility bills. Our knowledgeable crew will freshen granite rock scapes, add native plants, improve xeriscape, trim shrubs, remove weeds and recondition swales. We offer one-time cleanups as well as regularly scheduled maintenance and beautification programs for residential and commercial properties. Perhaps you are selling, or have recently sold, your home or business property. Pride of ownership goes a long way toward impressing potential and new owners. Keeping your landscaping looking its best is our specialty. We currently maintain and provide equal attention to small cottage yards as well as large apartment complexes and homeowner association landscaping. Are you in need of dependable landscape maintenance? Tell us about your landscaping maintenance needs. Call Jeff's Landscaping & Yard Service toll-free at (877) 820-0863 or Request a Quote directly from our website.